Ugh. Toronto is building new roads, but despite all the talk about making the city more pedestrian and cycling friendly, cyclists and pedestrians are still second-class citizens. We usually focus on old streets and making them more bike friendly by slapping on some paint where expedient, or physical barriers if we really care. It's rare that an old city like Toronto builds new roads, but as it fills in its former industrial lands with condos, a handful of new roads are being designed and built. In the Cherry Street extension in the Don Lands. In each case—even though the City is serving tens of thousands of people who would prefer to travel by transit, foot or bike—it seems that the City refuses to get out of a car-centric frame of mind. In the Don Lands, for example, the City built an extension to Cherry Street that could have easily included proper physical separation, but they pretended that we still lived in the 90s and defaulted to paint. And in Liberty Village, it's even worse, there's no cycling infrastructure at all. Over a decade ago as Liberty Village was first being filled in with condos, the City took a decidedly suburban, car-centric approach for such a population dense neighbourhood. This has resulted in a neighbourhood that is effectively trapped by railway lines and heavy car traffic. It's now quite uncomfortable to walk or bike into and out of Liberty Village. The main east-west street, East Liberty street has no bike lanes and is always jammed full of cars. Toronto is undergoing an environmental assessment for New Liberty Street which will be just to the south of East Liberty. But even here, their old-school traffic engineering prioritized on-street parking over safe cycling. The City's proposed plan is to build a multi-use path that vanishes 300m from Strachan Ave. Multi-use paths are already a compromise, since they force two different travel modes that want to go at much different speeds to intermingle. And then to add insult to injury, the planners decided that at the intersection that it'll be all given over to cars. It's not like this is just a cycling minority calling for proper cycling infrastructure here. The City's consultation in 2011, “New Street should have bike lanes”. And at the next consultation meeting, “Enhance pedestrian / bike access to GO station” was also strongly agreed, the 2nd highest after “heritage buildings”. 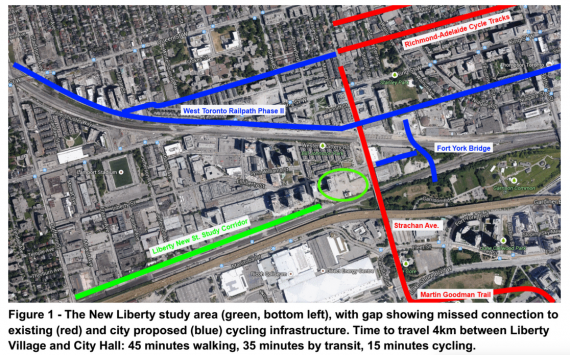 The groups have suggested changes to New Liberty Street so that cyclists can safely connect to Strachan and thus get out of the urban prison that is Liberty Village. 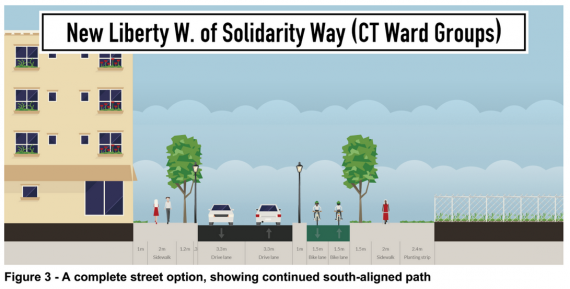 Instead of the proposed design for New Liberty St., shown as ALIGNMENT OPTION C(ia) drawing 8860WF23-13 as shown in Figure 2, the groups are presenting their alternative in Figure 3 below. Motor vehicle lanes widen to 4.1m and the multi-use path vanishes at the private road. Without connectivity, the multi-use path is useless to children / parents / seniors. New Liberty doesn't connect for northbound Strachan or eastbound Ordnance cycling traffic, and north-south parking garage access streets nor East Liberty St. have no bicycle accommodation. Two 5.5% grades are introduced at the private road. Such slopes are difficult for children / seniors to climb, especially without any safe right-of-way to balance in. The highway off ramp-like New Liberty / Strachan intersection introduces three bicycle-car turning conflicts, has poor sight lines. The turning radii for car lanes at the New Liberty / Strachan and East Liberty / Strachan intersection encourage fast car turns through conflicts. Normalizing at 11m radius is sufficient. The bicycle mode share for Ward 19 is an incredible 12% considering the generally poor parking-door zone streets and the lack of bike lanes. Downtown is already completely car congested. An effort to eke out a fractional greater car capacity into and out of Liberty Village is myopic and a waste of time. A properly physically separated bicycle infrastructure would much more efficiently increase the transportation capacity. Considering that the City is working on a Complete Streets plan, this makes this project seem like it's the last gasp of outdated, wrong-headed engineering. Or at least I hope it is. Hi Herb, thanks for writing about this! If you look closely at the middle-right of the plan view (between "interim" and "ultimate" phases) you can see that the multi-use path ends midblock. The City hasn't responded to our questions about why this is shown. Seems a lot like the typical Toronto "when the going gets tough, the bike lane vanishes". Looks like the Ford brothers had a hand in this when they were around. Their version would be "cheaper" of course. However, to fix it after will cost us, the taxpayer, more now. Last I heard the project was delayed precisely to deal with that pinch point. There are land ownership issues with GO Rail and a cellphone tower that pinch the ROW at that point. The city was in negotiations to potentially relocate the cellphone tower and resolve that issue. The right-of-way is the same width the whole way through, even with the pinch point. It's just that the City widens the car lanes from 3.3m to 5.5m and removes the multi-use path. The blueprints don't show it clearly, but zoom in and you'll see. News from Mike Layton's office: Transportation staff have been persuaded that the multi-use path can continue all the way to Strachan. But! They're still claiming it's impossible to connect the New Liberty multi-use-path to the East Liberty / Strachan intersection. The only connections possible will be to the southbound Strachan painted lanes (the Strachan bridge has a concrete divider). An improvement, but not a full solution, yet.